Kotak Mahindra Bank (कोटक महिंद्रा बैंक) is a private sector bank in India and the bank was incepted in 1985 as Kotak Mahindra Finance Limited. At present, the bank offers many services and the bank is also known for offering the highest rate for the saving bank account. Apart from this, there are many other advantages of the Kotak Mahindra Bank like it is possible for you to open the bank account online without having to visit the branch. Today, the bank has a network of over 1370 branches along with over 2160 ATMs in the country. Step 1: The first part of the process is to visit the net banking portal of Kotak Mahindra Bank. You can access the portal by www.kotak.com. Once the portal is displayed, you can navigate to the right hand side of the screen and click on the login button for net banking. Step 2: A new page will be displayed and you should now have your debit card handy for Note that there is a number mentioned under your name and the number is called CRN Number. On the login page, click on 'register for net banking'. If you are unable to find the link, you may click https://www.kotak.com/j1001mp/netapp/MainPage.jsp to be redirected to the net banking registration link. 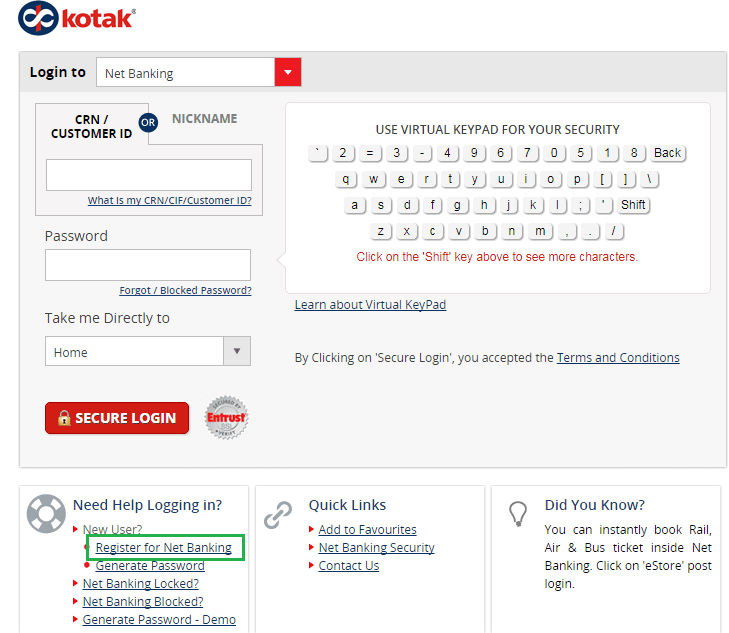 Step 3: On this new page, enter your "CRN Number or the Customer ID" which can be used for logging in to the net banking portal of Kotak Mahindra Bank. Click on the "continue" button and you will be now redirected to the next step. Step 4: In the next step, you would have to verify your details and these details include Date of Birth, Mother's Maiden Name, Registered Mobile number and Registered Email Address. You can verify any two questions among these four questions. Enter the details and click on "continue" button. Step 5: Next you have to choose method to generate password, here we are selecting debit card details. Now enter debit card number, expiry date, cvv and debit card pin, click on 'continue' button. Similarly you can choose other methods too. 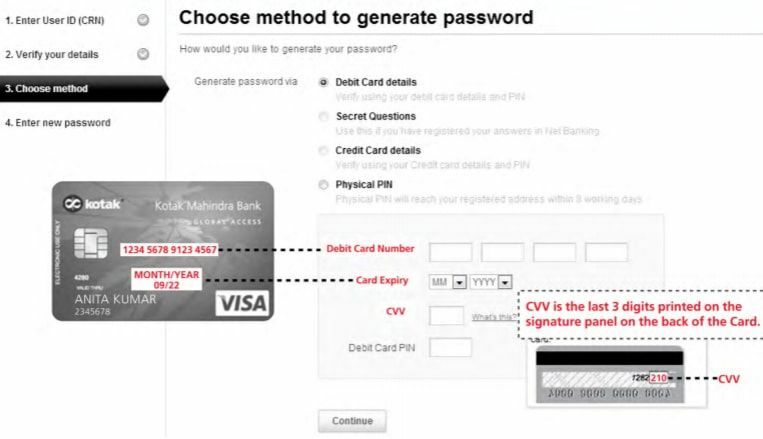 Step 6: You will now be prompted to enter a password for your Kotak Mahindra Bank Account. Enter a new password and re-enter the new password to ensure that there is no mistake in the password. After entering the password, click on submit button and you are now registered for the Kotak Mahindra net Banking. You will receive 6 character password on your registered mobile number. 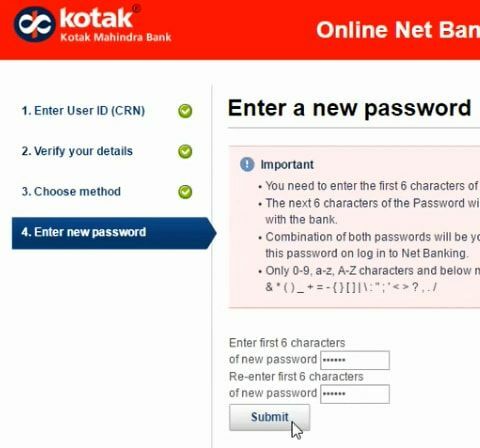 Combination of 6 character created password and 6 character received password will be your login password for kotak net banking. Later you change to new password of your choice. Step 7: You can now navigate to the login page mentioned in the first step and enter your CRN Number along with 12 character password to access the net banking facility provided by the Kotak Mahindra Bank. It just takes about two to three minutes to activate the net banking in Kotak Mahindra online. The process is quite simple and you just have to follow the steps mentioned here. Always have the net banking activated as this can help you in making day to day transactions with ease.